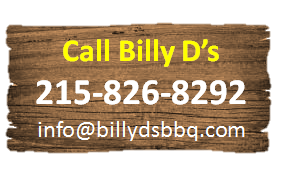 Billy D's Bar-B-Q - The Best Barbeque in Bucks! Assorted Soups, Pepperoni and Cheese, Italian Meats and Cheese Tray, Vegetables trays, Stuffed Mushrooms, Assorted Hot Appetizers, etc. Copyright © 2015. Billy D's Bar-B-Q. All Rights Reserved.